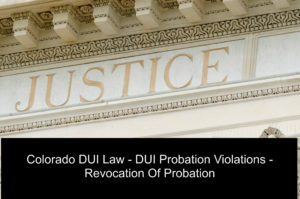 Colorado DUI Law – DUI Probation Violations – Revocation Of Probation – Colorado probation laws can be complex and frightening. Even when you believe you have complied with the terms and conditions of your probation – you may be facing a revocation of probation hearing. This article looks at the laws and practicalities of a Colorado DUI revocation of probation procedure to help you understand what happens in these proceedings. All probation violations begin the same way. A probation revocation complaint must be filed which alleges that you have violated one or more of the conditions set for your probation. The law requires something called “notice and a hearing.” Ultimately you will be required to either admit one or more of the allegations in the complaint or deny them and demand a hearing. There is no jury trial. A probation revocation hearing is conducted by a Judge and the burden is on the prosecution to prove the allegations contained in the complaint to revoke. If you win the hearing – that is, the complaint is not proven, you are “returned to probation” under the pre-existing terms and conditions of your probation sentence. But if you lose the hearing, the Judge has the right to re-sentence you to any sentence that the court could have originally imposed. This law governs the procedures for the initiation of the probation violation complaint and also for the procedures for summoning or arresting the probationer for advisement and hearing. This law governs the actual procedure and procedural protections for conducting the revocation hearing. 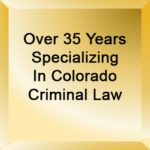 Certain appellate decisions, (decisions by higher courts), guarantee certain constitutional protections that must be accorded to you in Colorado probation revocation proceedings. These cases interpret and help define the statutes above. But note this, the procedural protections in probation violation cases are much less “protective” than those given to a person first accused of a crime before conviction and before that person has been sentenced to probation. 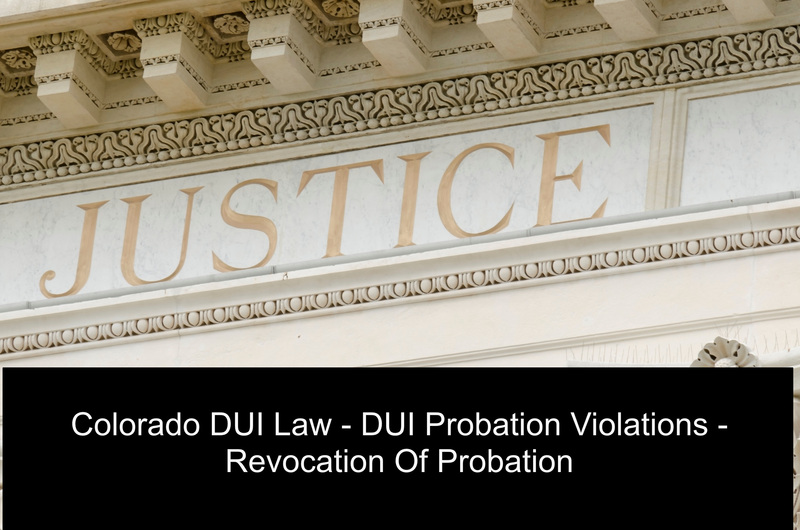 In almost every case a Colorado probation revocation proceeding is initiated by the filing of a complaint by a probation officer or district attorney. This procedure is required by C.R.S. § 16-11-205(5). The name of the probationer. A statement of the alleged violation or violations. The date and approximate location of the alleged or violations. A signature of the probation officer or the district attorney. What usually happens is the Court sends a summons, along with a copy of the complaint to the last known address of the defendant. The “service” of the summons and the attached complaint (and notice of hearing) can be served on the defendant’s attorney, but usually it is just mailed to the Defendant at the last provided address since most lawyers withdraw from representation after the sentencing hearing in the case. (Crim. P. 44(e) provides that counsel’s representation automatically terminates following the conclusion of trial court proceedings). Alternatively, if a Judge is requested to arrest the probationer and finds that an arrest is “reasonably necessary,” the Court may issue a warrant in lieu of a summons. (See C.R.S. § 16-11-205(6)). Colorado probation officers have the right to arrest a “probationer” even before a probation revocation complaint is filed (C.R.S. § 16-11-205(1)). That arrest can happen EITHER with an arrest warrant OR with probable cause to believe that a crime or a probation violation has been or is being committed by the probationer. If a complaint has not yet been filed and an arrest has been made – the probation revocation complaint must be filed within seven working days of the arrest. (C.R.S. § 16-11-205(4)). If an arrest has not been made or a complaint timely filed within before the expiration of the term of probation, a Judge loses jurisdiction (the authority) to proceed on the probation violation allegation. (But see revocation of deferred judgment agreements below). (4) the filing of a report by the probation officer, or a verified complaint by any person, together with a request for an arrest warrant. What If I Fail To Appear For My DUI Probation Violation Court Date? If a “probationer” fails to appear after receiving the summons from the court, a failure to appear warrant is issued for the arrest of the Defendant. Sometimes the failure to appear is because the Defendant failed to update the probation department of a change in address. If that happens, that is another “independent” violation of probation. (C.R.S. § 16-11-205(2)). (5) the nature of the allegations in the complaint. The Judge must locate and serve the Defendant a copy of the probation violation complaint. (C.R.S. § 16-11-206(1)). At the time of the probationer’s advisement the Judge will ask whether the probationer admits or denies the allegations in the complaint. If he or she admits the complaint to revoke probation, the Judge may proceed to sentencing or set the matter over for an updated pre-sentence investigation for the purpose of re-sentencing the case. What Happens At The Hearing On A Colorado DUI Probation Violation? Once the probation revocation proceeding actually begins, the law requires the Judge to again advise the probationer of the allegations in the probation revocation complaint and of the possible penalties in the event one or more probation violations are found. The burden of proof at the revocation hearing is on the prosecution but not beyond a reasonable doubt (unless a new crime is the basis for the alledged violation). The burden of proof is the same as Colorado’s civil burden of proof – the allegations of a violation of DUI probation need only be proven “by a preponderance of the evidence” or just above 50% proof.. BUT, if the State is alleging a new criminal offense as the basis for revoking DUI probation, then the burden of proof is the much higher standard of “beyond a reasonable doubt.” Note this also – if the probationer has already been convicted of a new offense, the burden of proof drops back to the civil standard of proving that conviction happened. Finally, if the new charge is still pending in another case or in another jurisdiction, the Judge will almost always continue the hearing – or “trail” it until the resolution of the new charges. The Strict Application Of The Colorado Rules of Evidence Not Applied To Colorado Probation Revocation Proceedings. CRE 1101(d)(3). Other rules that suppress evidence illegally obtained – which would normally require exclusion under the “exclusionary rule” in most other criminal procedural matters, do not apply to Colorado probation violation hearings. For example, hearsay evidence, which is not allowed in a trial unless there is a specific rule which permits it, is always admitted at a Colorado probation violation hearing as long as the Defendant has “a fair opportunity to rebut” (to fight) that hearsay. In addition to allowing hearsay to be freely admitted, there is no constitutional right to confront one’s accusers and to the extent that the Defendant has a right to confront the State’s case in a Colorado DUI probation revocation proceeding, …that right is severely limited and it arises from the due process clause, not the confrontation clause of the Constitution. A Colorado DUI probation violation hearing is not like a trial. However, the procedure for conducting a probation violation hearing provides for certain minimum due process righrs based on the Constitution. (6) The right to counsel at a revocation proceeding if the prosecution is seeking jail time. Unlike an actual trial, most criminal defense lawyers do make opening statements at a probation violation hearing. The prosecution presents their case – “the evidence” – through witness testimony (usually just the PO – the probation officer), the Court takes “judicial notice” of the Court file (what has happened in the case to date) and any agreements (called stipulations as to the evidence), are admitted if any are made with the defense. The Defense is entitled to cross-examine any prosecution witnesses. After the prosecution finishes putting on their case and rests, the Defendant may make an oral Motion to Dismiss the probation revocation complaint if the Defense believes allegations in the complaint have not been proven. Usually the Motion to Dismiss is denied. When it is, the Defendant has the right to present their case which can also include witnesses or other any other evidence that bears on rebutting the State’s case. The Defendant has the right to testify if he or she chooses. At the conclusion of all the evidence, the lawyers DO usually make closing arguments – arguing their respective positions and their individual interpretations of the sworn evidence offered at the contested hearing. The Judge then makes findings of fact and conclusions of law as part of its ruling on which side won which issues and once again, if the Judge finds the allegations have not been proved, the Judge will reinstate probation for any remaining period under the pre-existing terms and conditions. On the other hand, if the Judge finds that the probation revocation the allegations have been proved, the Judge will revoke probation. While most Judge’s make the decision to revoke or not to revoke probation immediately, the law allow allows the Judge 7 days after a finding of a violation to decide whether to revoke or continue probation. As a practical matter, most Colorado DUI probation violation complaints are customarily resolved through comprehensive discussions with the DA. Plea bargaining in this context can be difficult because of the lack of leverage a convicted Defendant has at this stage in the criminal justice system. An experienced Colorado criminal defense lawyer will almost always seek the reinstatement of probation with an extension of time for the Defendant to complete the terms and conditions of probation. The better course of action is not to “enter a plea” but to try to continue the formal resolution of the complaint to provide the Defendant an opportunity to finish probation successfully. Many Colorado Judges are very strict in the context of violation of probations and do not always agree to a continuance for the purpose of finishing out the terms and conditions of probation they originally set at sentencing in the case. These Judges often put different restrictions on the types of agreements that are acceptable to the Court under these circumstances depending on how aredious the probation violations are as alleged. The law is this in every probation violation case that has been proven is the same: unless there is an agreement to the contrary (a plea bargain) that the Judge approves in advance, if probation is revoked, a Judge may impose any sentence, or grant any new terms and conditions of probation that the court might originally have imposed or granted – and that includes a punitive or jail / prison component. Here is the rub – and the most important part – the “re-sentencing power” of the Judge exists without regard to any sentence concessions that might have been part of the original plea agreement. What that means is the Judge is free to impose a jail sentence despite the initial plea bargain stipulations to probation at the time of any historical (prior to the revocation of probation) plea bargains in the case. The Judge is NOT bound by the DA’s recommendations and may also decide NOT to re-sentence the Defendant to jail or prison after the Defendant has lost the probation violation hearing. Are Probation Revocations In Deferred Judgment And Sentence Cases Different? Most of the time the rules and laws above apply equally to deferred judgement and sentence agreements. For example if a Defendant is on a deferred judgment and sentence for an offense ,and violates the terms and conditions of probation with one exception (drug possession cases), the Judge must revoke the deferred judgment and enter a conviction in the case at sentencing. To repeat, in almost every circumstance, a Colorado Judge does not have the authority to reinstate a deferred sentence, and again, after the conviction enters, the Judge may impose probation or any sentence that is otherwise authorized by law. But there are at least two major differences that apply only to revocations of deferred judgements. First, the State has the right to apply for the revocation of a deferred judgment and sentence during the period of the deferred (same as regular probation) but the difference is this – the State also has the right to filed a complaint to revoke a deferred judgement and sentence within 35 days following the last day of the deferred judgement. As long as the petition for revocation of the deferred judgement is filed within this 35 day period, the actual revocation proceedings may occur outside of the extended period. Second, and this bears repeating, in almost every circumstance, a Colorado Judge does NOT have the authority to reinstate a deferred sentence after the conviction enters (with one exception for Colorado Drug Crime cases) and may impose probation or any sentence that is otherwise authorized by law. In 2010, the Colorado State legislature enhanced the penalties for DUIs and DWAIs. In the context of probation violations the section of the law that applied to probation-related penalties removed the Judge’s normal discretion to sentence within their usually broad discretion and mandated certain results be imposed. (C.R.S. § 42-4-1307(7)). Under the enhanced sanctions for violations of Second and Third (or more) DUI – DWAIs, the Judge has not choice but to impose the one-year jail sentence that was suspended at the time of sentencing. Note this important point – The jail sentence already served in the case is NOT credited against that one year sentence! BUT – and this is equally important, the Judge has the authority to impose all or part of the suspended year for the violation or violations of probation that were proven at the hearing. Before imposing the jail sentence, the law also requires the Judge to consider certain critical factors in making his or her decision to sentence to all or just part of the one year suspended sentence. Any other information relevant to assisting the defendant to comply with probation. If and when the Judge imposes jail time under this subsection the law requires the judge not to impose the sentence as pure punishment but rather to promote compliance with the terms of probation. If you found any of the information I have provided on this web page article helpful please click my Plus+1 or the Share buttons for Twitter or Facebook below so that others may also find it. The contents of this article are based upon my research, my personal experience and my personal analysis and opinions developed from my thirty-six years (as of 2017) of criminal trial experience from both sides of the courtroom – as a former career prosecutor for Arapahoe and Douglas Counties (13 years) and as the owner of my own Criminal Defense Law Firm since 1999 (18 years). H. Michael works hard to get his clients the best possible results in and out of the courtroom. He has written, and continues to write, extensively on Colorado criminal law and he hopes this article helps you in some small way – Colorado DUI Law – DUI Probation Violations – Revocation Of Probation .